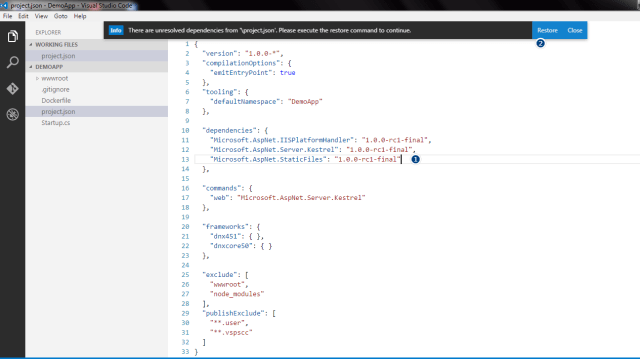 Creating ASP.NET Core 1.0 web applications is very easy using Visual Studio Code along with Yeoman generators. Here in this tutorial will learn about creating web application and running it. These steps are not confined to Windows environment alone, we can use them on Mac or Linux. This example is for creating basic ASP.NET Core 1.0 empty application without need of Visual Studio IDE. What we will learn here? Going through GETTING STARTED WITH YEOMAN will help us get Yeoman installed and its usage. Visual Studio Code (VS Code) is code editor redefining how simpler life can get, esp I liked idea of working with ASP.NET Core 1.0 apps without full fledged Visual Studio IDE. 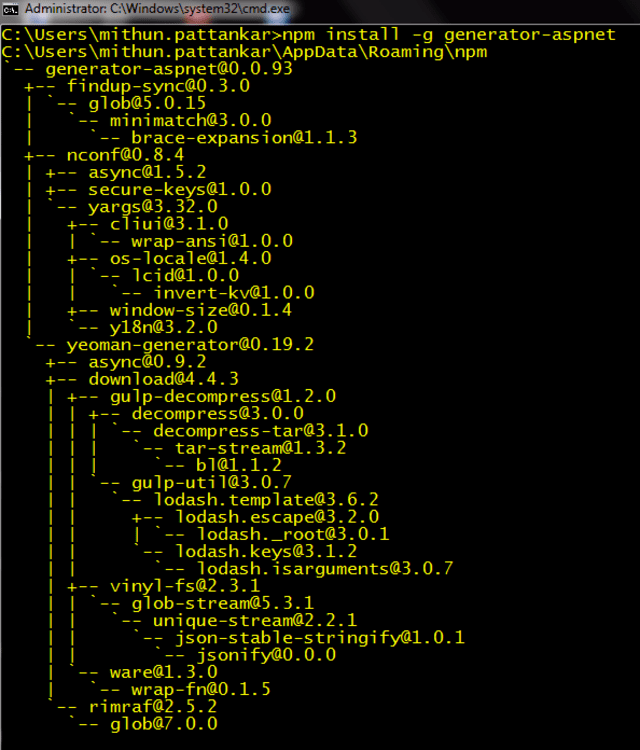 Quick snapshot of NPM, Yeoman installed. Installing them globally will avoid doing these steps again. 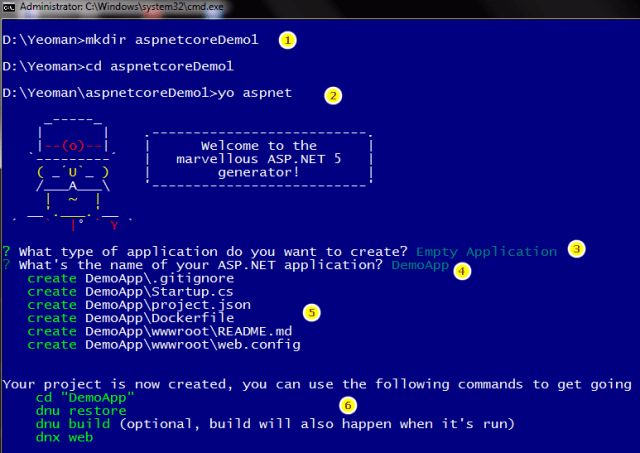 Now that Yeoman generator is installed, we need to install ASPNET generator for creating ASP.NET Core 1.0 applications. Recommend reading ASPNET generator for more understanding Open command prompt and run following command, ensure that you are connected to Internet. There are two ways to create ASP.NET Core 1.0 applications using Yeoman generators itself - Command line option and Visual Studio Code yo extension option. Creating directory which contains all generated code. ASPNET generators asks us to select various kinds of project to be created like empty, console, web, classlib etc. I choose “Empty Application”. After creation of application, its usually better to do DNU restore but we will hold that for moment. Now lets create using Visual Studio yo extension, (install yo extension first). Checkout GIF below for steps, I will be creating full ASP.Core 1.0 web application instead of an empty application. After adding “StaticFiles“ middleware in dependencies of project.json, then click “Restore“ to perform DNU restore. Visual Studio Code is just code editor, to run web application we need to use web server. We will install lite-server, just follow link to install lite-server. Now open wwwroot folder in console and run “lite-server”, it opens up browser and displays “index.html“. These steps can be replicated in Mac OS or Linux environments as Visual Studio Code and ASP.NET Core 1.0 are cross platform open source projects.